No matter what industry you’re in, safety and cleanliness are probably high priorities on your list. Building managers are constantly searching for new ways to improve their facilities, making use of any tactic that proves to be beneficial. Having an ally on your side in the quest for operational efficiencies and clean operations can prove to be a gamechanger. Super Serv is here to be your go-to cleaning company for any and all facility needs. Our top-quality staff focuses on streamlining your facility needs by focusing on operational efficiency and reduction of waste and miscommunication. If you are looking for professional commercial cleaning in the Boston area, you’ve come to the right place! One way that your facility can improve its safety and cleanliness is to install commercial floor mats. We’ll look at a few benefits that you can expect from these inexpensive products, as well as the added value they can bring to your business. When you’re in need of professional cleaners, be sure to reach out to Super Serv for assistance! No matter what material your floors are made of, the combined wear and tear will eventually break the material down. Heavy objects and dense foot traffic can create a major strain on entryway flooring. The combination of scuffs, scratches, dents, and stains can create an unsightly first impression when guests and employees enter your building. Floor mats are useful for creating a buffer for your floors, absorbing impacts and damages instead of the materials underneath. While installing a commercial floor mat in your business isn’t a sure bet against damaging your costly floors, it can certainly help! A large amount of dirt and debris can be tracked into your business from the outside world. A floor mat can be effective here by collecting and stopping any filth before it is free to roam the structure. The effects of this improved state of cleanliness can be far-reaching for anyone that steps through the entrance. Like we’ve said before, first impressions are very important, and providing a clean space for guests and employees is a great help in nailing that first impression. Modern technology has helped to make floor mats a better investment than ever before. By utilizing antimicrobial technology, your floor mat can effectively eliminate bad germs and bacteria before they can settle and expand their operations. This can be very helpful in industries that hold stringent sanitation demands, such as a hospital or specimen laboratory. Other businesses can benefit from these mats as well, typically in a restroom or kitchen setting. The accumulation of dirt and debris that piles up at your entrances can create numerous hazards for employees and guests alike. When water is introduced, the risk of slips and falls rises exponentially. Installing a commercial floor mat at the doors can work effectively to keep the area safe and secure. By controlling the amount of dirt on the floor, your mat can minimize the slip potential made by loose debris. Floor mats also feature no-slip grips on the bottom, keeping everything in place when exposed to water. Make sure that you find a non-slip version when shopping for mats! Once guests enter through your business doors, the first area they will see is the interior of the entrance and your lobby. It’s essential to provide a clear, clean area to deliver the impression that you care about the quality of your work and your facility. Floor mats deliver numerous benefits, many of them contributing to the message that you deliver to guests with your company’s appearance. Certain companies will even offer customized mats to place your company logo neatly on the floor, creating a solid source of branding for your operations. The small step of printing your logo onto these mats can prove to be a solid source of business, creating more trust for your brand. There are many ways in which you can improve your operations. Installing commercial floor mats is one measure that may prove to be very beneficial. Doing so can reduce the damages and dangers associated with company entryways. If you’re in need of quality commercial cleaning in Boston, our company of trained experts is here to help! Super Serv is proud to provide unbeatable services aimed to keep your facility clean while also reducing overhead costs. 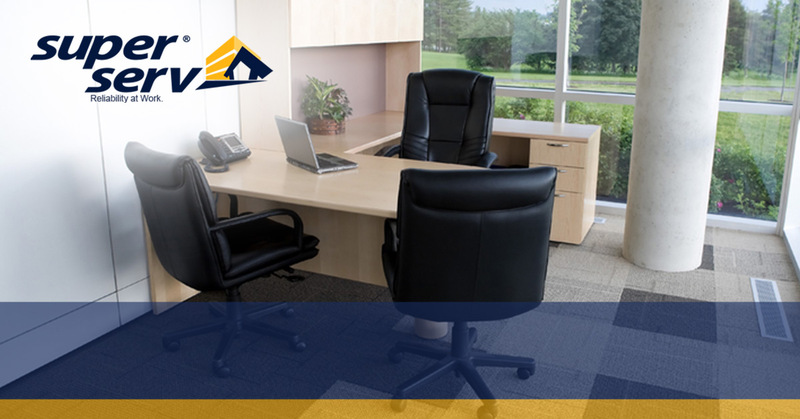 Contact us today to learn more or to receive a quote for your building!